Skupiens large and small celebrate making it to Laurel Falls. 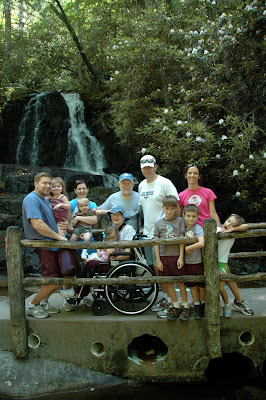 Well before my April 22, 2011, stroke, husband Walter had reserved a campsite in the Great Smoky Mountains National Park for June 29-July 6. 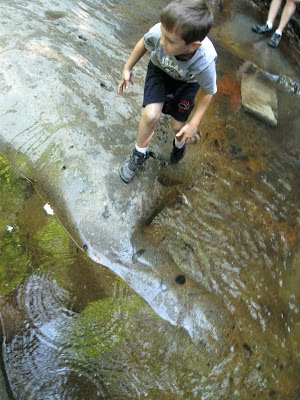 Elkmont Campground near Gatlinburg, TN, was our choice, high enough up the mountain to provide cool nights. 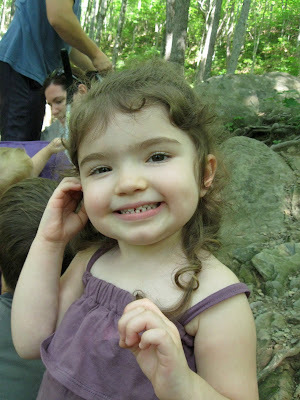 We were looking forward to our oldest son, his wife and four little ones ages three through nine camping next to us. 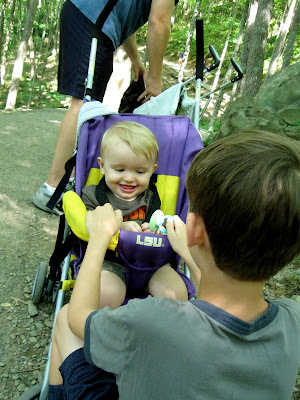 We were also anticipating our youngest son, his wife and their 14-month old son and three-year-old daughter “camping out” at Bearskin Lodge in Gatlinburg and joining us for daytime fun. For the third year, we had also planned to pick up our two oldest grands, ages 9 and 6, for two nights camping with us until their parents arrived. Optimistic during my earliest rehab, we saw no reason to change plans. It was probably good that our children’s wisdom prevailed. Son Walt and wife Sarah, said maybe next year the boys could join us. Soon after we arrived at our campsite, we realized that our optimism was based on faulty assumptions about how long, how often and how involved certain post-stroke tasks would be in the camping environment. We did a bit of experimentation and adjustment between our arrival on Wednesday and our children and grands’ arrival on Friday. 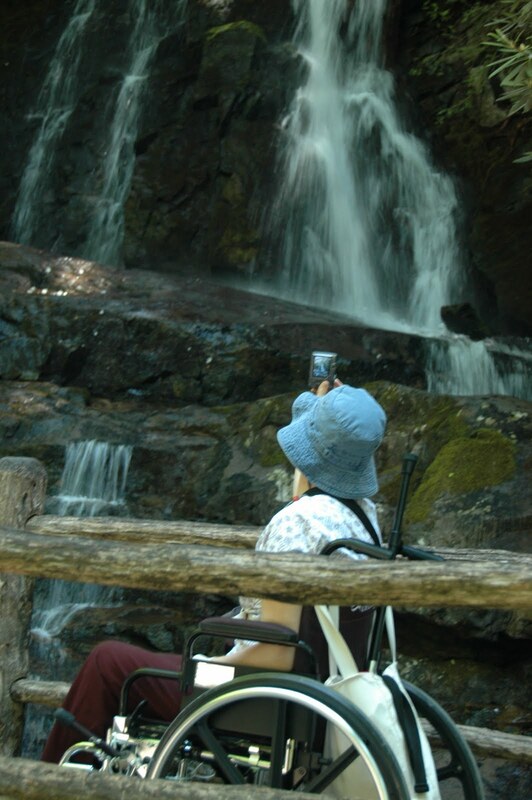 But our assumptions about a “hike” to Laurel Falls produced the most dramatic results--an unforgettable thrill ride for me and heavy-duty work for hubby and sons Walt and Jeremy. What we had remembered as a nice paved trail was in reality considerably narrower than we remembered and had torturous dips, bulges and tree roots. Time, weather, foot traffic and invading tree vegetation had taken its toll. A rest stop on the Laurel Fall trail includes a little rock climbing for the grands, including sisters Stella and Charlie. Youngest grandchild Walker enjoys the attention of our oldest grandchild, his cousin Luke, during a pause in the climb to Laurel Falls. Going up, we were on the right, hugging the side of the mountain. The trail’s blemishes that required exceptional maneuvering on the way up were absolutely scary when we were coming down on the outside edge. Thanks to our guys for teaming up in shifts to get me down, one controlling the wheelchair’s descent and another lifting the front wheels out of the dips and over the bulges and bumps that could have sent me catapulting out for an extra speedy trip down the side of the mountain. 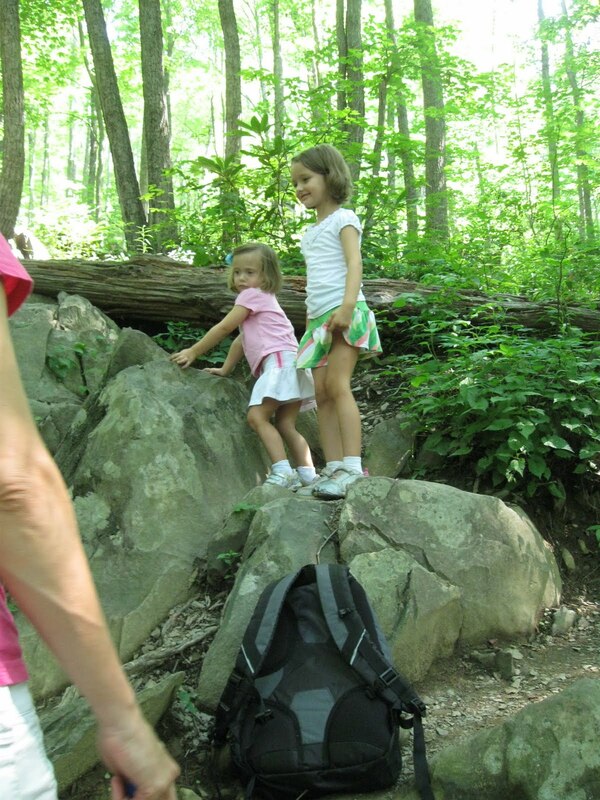 Also thanks to daughters-in-law who provided creativity, muscle and finesse in getting little ones up and down safely and, for the most part, happily. In between the trip up and the trip down, we spent some time enjoying the falls. 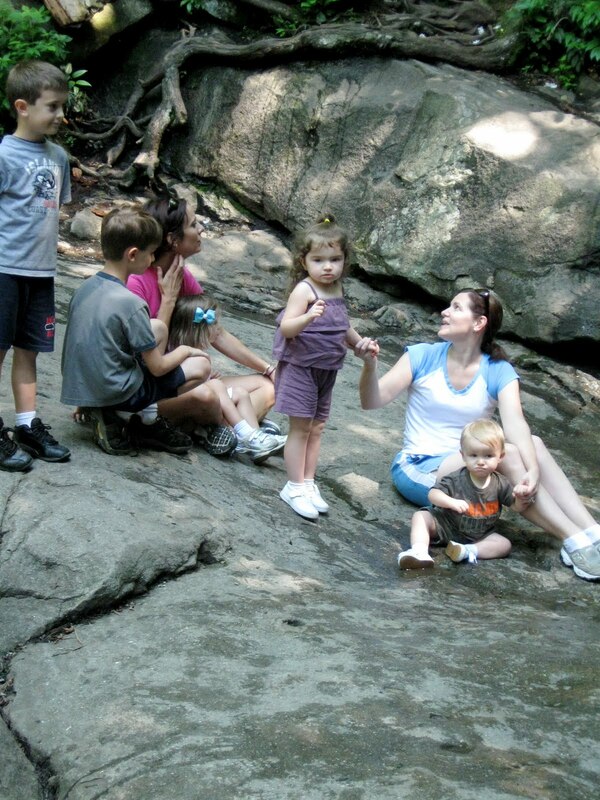 Grandchildren and mamas enjoy the cool breeze and views created by the cascading waters. Nana snaps memories from her wheelchair perch. Grandson Nate explores the slippery shallows. Grandson Luke humors Nana by posing in front of the falls. 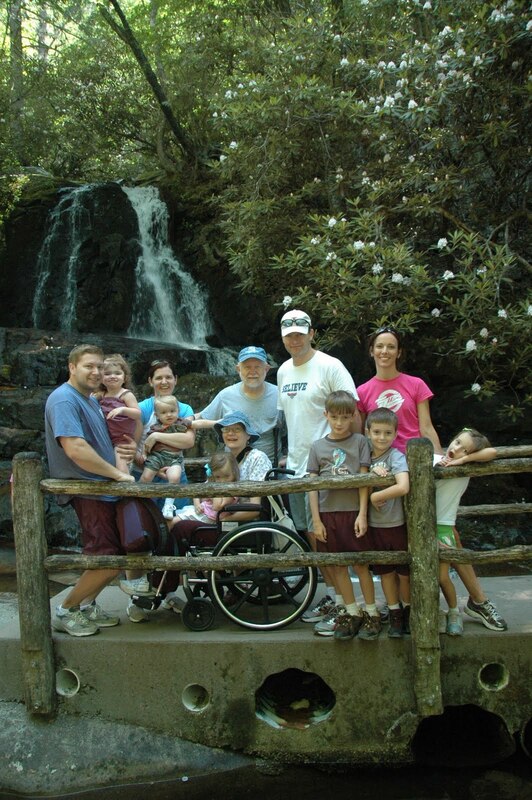 Our experience was a shared adventure that created special Smoky Mountain memories. You always make your trips sound so enjoyable and fun - makes me wish I were there with all of you. Can't wait for the next installment. It might have been some work, but I'm sure that it was worth it for the group. What a wondrful family adventure! Every part of this post was special. I love your spirit! I love your family's esprit de corps. It sounds scary and kind of dangerous to me, whether in a wheelchair or not! Molly Kate is so cute!!! I'm so glad it all worked out well, though, and you all had a good time! We took our grand to Natural Bridge today and it was a bit much for Phil to keep an eye on her and maneuver my wheelchair. And so HOT, but fun! How hot was it there? this story certainly proves the saying where there is a will there is a way. Wow! you have a wonderful family to do this for you. precious memories for sure. your grand babies are really beautiful. so happy for you that you could enjoy this trip. Good times and a great adventure! I am so proud of you Nana! You are an inspiration to us all and we love you so much! 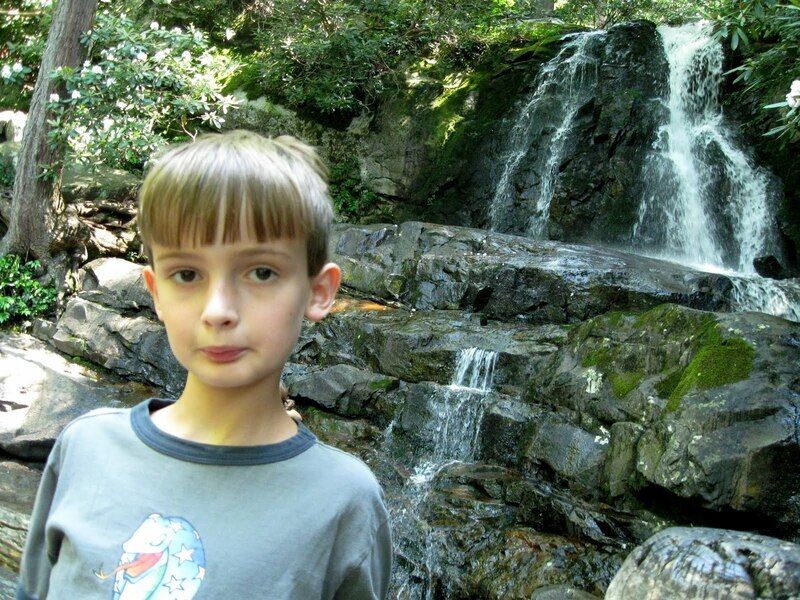 I'm so happy that we were able to spend this time together in the Smokies! Linda, you continue to be my hero. I enjoyed reading your blog. My sister-in-law had a serious stroke just 3 weeks ago. Your story is very encouraging. I admire your faith and your determination.